The average laying hen spends a significant amount of her lifetime producing and laying eggs. Your hen's body creates a new egg roughly every 24 to 27 hours, resulting in her laying more than 200 eggs each year. If you take a little bit of time to get to know your hen's laying habits, you should not have any problem telling when your chicken is getting ready to lay a new egg. Your hens have to be old enough to lay eggs. Most pullets will be between 16 and 24 months of age when they lay their first eggs. Once the first egg has been produced, the pullet should begin producing eggs with more frequency. Do not be surprised if your hen's first eggs are small, infrequent or misshapen. It will take her body a little while to get used to producing eggs in a uniform fashion. If you are waiting on your pullets to mature, there are several physical signs you can look for to tell if the time is coming near. Pullets will develop a more mature appearance, taking on the look of full-grown hens. They will have deeper, darker red combs and wattles and their pelvic bones will begin to separate. You can check your pullet to see if the pelvic bones are beginning to separate by holding her snugly and securely in your arms while you feel the three bones at the back of her body. If the bones feel close together, she is not ready to lay an egg. If the bones are spreading apart, her first egg is probably going to be on its way soon. If your hens live in a coop, you can expect a hen who is getting ready to lay to start searching for a private place to lay her egg. 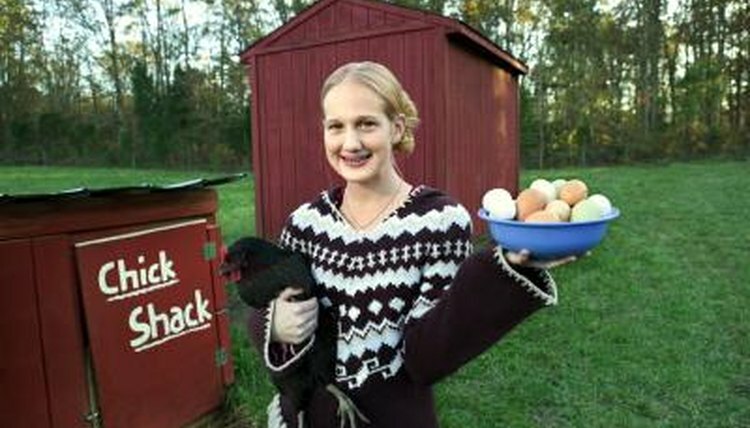 Your coop should be equipped with nesting boxes full of nice, dry straw or clean wood shavings so that your eggs will have ample cushioning. A hen who is getting ready to lay an egg will climb into the nesting box and may start scratching around or rearranging the bedding until it suits her liking. You may notice her spending a significant amount of time inside the nesting box before she actually lays the egg. If your hens are free-range, you may notice your hen disappearing into the far corners of your yard for extended periods of time as she searches for a private place where she feels safe laying her egg. When your hen is ready to lay an egg, she will sit on her nest and may be seen straining slightly. Some hens will also become vocal, crowing, cackling or otherwise calling out to the other members of the flock as they lay their eggs. If your hen seems to be spending a significant amount of time in the nesting box and straining but does not produce an egg for several days, she may be egg bound and you should contact your veterinarian. My Pet Chicken: Are There Signs That a Hen May Be Laying?